Getting a goldfish seems like an easy decision. But what happens if you no longer want to care for the pet? 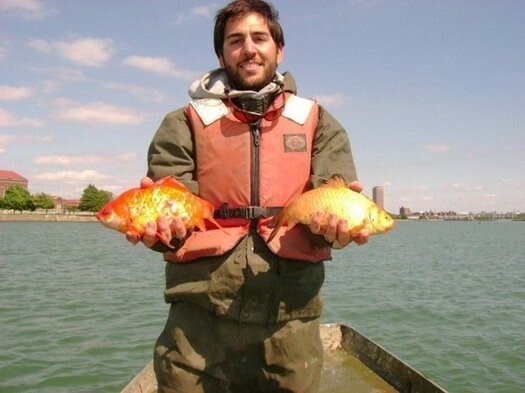 Your best option is to donate the fish, because flushing the specimen down the toilet can cause problems in lakes, ponds and waterways, That's because what starts out as a tiny goldfish or koi can end up becoming much larger. Those small fish can grow to be the size of dinner plates What's troubling about these giant goldfish/ koi is the harm they can do to the local ecosystems. The fish can carry diseases, reproduce quickly, displace native fish species, and root up native plants to find food. Aside from goldfish, piranha, Amazonian catfish, koi and even a caiman have been found in public waters, presumably from people flushing them down the toilet or releasing them in the water. As for flushing, there are kinder ways to euthanize a fish. If a fish is less than two inches long, exposing it to freezing cold water can render it unconscious. But donating the fish is your best bet.